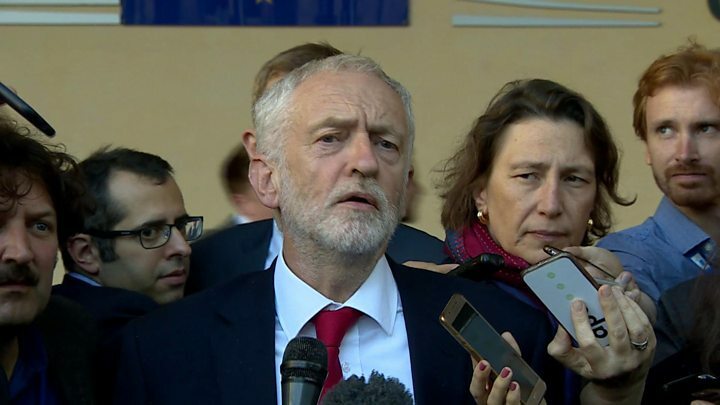 Media captionJeremy Corbyn: "We're obviously not negotiating, but he was interested to know what our [the Labour Party's] views are"
Jeremy Corbyn has met the EU's chief Brexit negotiator in Brussels for what the Labour leader described as an "interesting, useful discussion". Afterwards, Mr Corbyn said he was not negotiating with Michel Barnier, who he said had offered "no opinion" about Labour's vision for Brexit. Labour has said it will oppose any deal Theresa May brings to Parliament if it fails to meet its "six tests". Mr Barnier said he was "continuing to listen to all views on Brexit". Mr Corbyn was joined by shadow Brexit secretary Sir Keir Starmer for the talks, which come after Mr Corbyn told his party conference that he would back Theresa May if she proposed a "sensible" deal that kept the UK in a customs union with the EU. The PM has repeatedly ruled this out. Speaking after the meeting with Mr Barnier, Mr Corbyn said: "We've had an interesting, useful discussion with Mr Barnier. We have set out the views of the Labour Party surrounding Brexit following the conference speeches made by Keir Starmer and myself. "We are obviously not negotiating. We are not in government, we are the opposition. "But he was interested to know what our views are and the six tests we have laid down by which we will hold our government in future." Asked if Mr Barnier had offered views on Labour's Brexit plan, Mr Corbyn said: "He made no opinion on this. It's not a negotiation, it's us informing him of what our views are and he telling us what the state of play was on the negotiations." EU officials said the timing of Thursday's meeting, coming just days before the start of the Conservative Party conference, was a coincidence and stressed that it was not part of the negotiations. The meeting coincided with Mr Corbyn's trip to the Belgian capital to witness a square being renamed in honour of Jo Cox, the Labour MP who was murdered in June 2016. Speaking ahead of his meeting with Mr Barnier, Mr Corbyn said he would urge EU officials "to do all they can to avoid a 'no-deal' outcome": "Crashing out of Europe with no deal risks being a national disaster." Mrs May is under pressure to rethink her approach after European leaders warned key parts of her Chequers blueprint, which would keep the UK closely aligned with the EU in trade in goods, for future relations with the EU were not viable. Home Secretary Sajid Javid said talk of a referendum on the outcome of the Brexit negotiations - which Labour has said must remain an option - was "deeply unhelpful" to getting the best deal for Britain. But illustrating divisions within the Conservatives, his predecessor Amber Rudd told ITV's Peston that a new public vote was "absolutely" preferable to the UK leaving the EU next March without an agreement. And backbencher Nadine Dorries said Mrs May should step down as she had become "handcuffed" to the Chequers deal and was not communicating the benefits of Brexit. In his keynote leader's speech in Liverpool, Mr Corbyn said Labour would oppose a no-deal outcome and would also vote against any deal based on Chequers, as it would be extremely unlikely to meet the party's six tests, which include delivering the "exact same benefits" as members of the Single Market and Customs Union. But he said if the PM brought home a deal that "includes a customs union and no hard border in Ireland", that protects jobs, people's rights at work and environmental and consumer standards, it would get his backing. Diplomats from the EU's 27 other members were briefed about the bloc's planning for a no-deal Brexit on Wednesday after a leaked document said the work had to intensify because of uncertainty about whether a final deal can be reached and approved by the UK and EU Parliaments.